Diarrhea symptoms are often mild and clear up quickly but severe diarrhea or chronic diarrhea can be more worrying. Diarrhea itself is not an illness but it is a symptom. Often when people talk about the symptoms of diarrhea they want information about other symptoms that can go along with it. Read on to find out what diarrhea really is and isn't, which other symptoms often accompany diarrhea and when you should call the doctor. Diarrhea itself is extremely common and affects most people at least once or twice a year but people tend to have different ideas about what it is. In fact diarrhea is defined by the World Health Organisation as loose or liquid unformed stools three or more times a day or more than is usual for the individual and weighing in excess of 200g. But let’s face it we are not going to get the scales out! these things alone are not diarrhea but you should contact your doctor if you are having such problems. 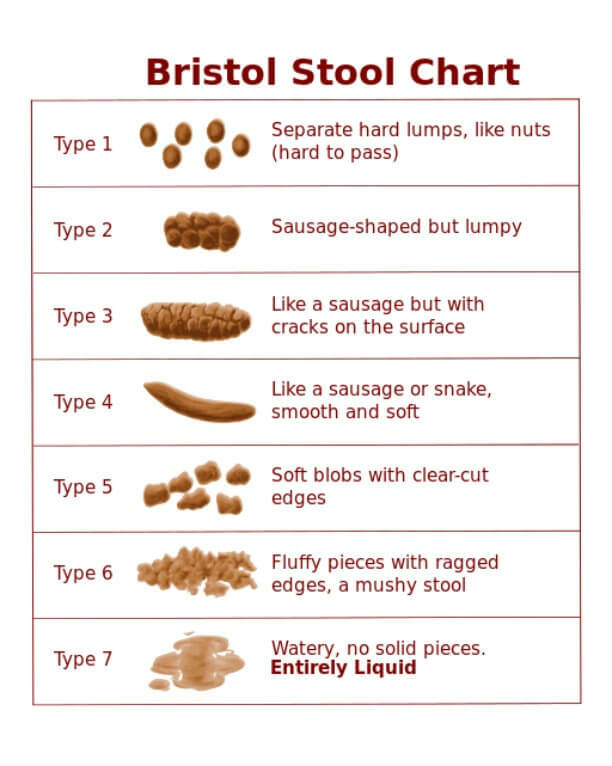 The Bristol Stool Chart or Scale is a way of defining the type of stool that you are passing and this can be an aid to healthcare professionals that want to understand your diarrhea symptoms. Stool types 6 and 7 are classified as diarrhea. By Bristol Stool Chart.png: Kyle Thompson derivative work: Jpb1301 [CC-BY-SA-2.5-2.0-1. So what is normal? The healthiest are types 4 and 5. If your diarrhea symptoms only last for 24-48 hours and you do not have other symptoms then it is not necessary to see a doctor but there are situations where it is important to get medical help. It depends on the symptoms and who is ill. There are certain signs and symptoms of diarrhea which can indicate to your doctor that something more serious may be going on and you may have an underlying health condition. A sign is something which can been seen by you or your doctor and a symptom is something that you feel, although this word is often used in a more general way by many people to describe anything associated with their illness. Everyday thousands of people around the world suffer with diarrhea symptoms which can be distressing or even dangerous but usually they will recover with no ill effects provided they drink plenty of fluids with the right mix of salt and sugar. Please read this article for more information. When you have diarrhea it is best to stay away from other people as much as possible to avoid passing on any infection like salmonella, e.coli or c.diff and so it is best to get advice before going to a medical facility. When at home if possible do not share a toilet with other people. Wash your hands thoroughly and do not share towels. I have tried to give you some of the facts that you need when you have diarrhea symptoms but I guess that if you are looking at this page then either you or a loved one is suffering. Diarrhea can make you feel very miserable and even though in most cases it will pass, while you are suffering you can feel terrible. Obviously some people have chronic diarrhea and this is even more difficult to cope with. I just want you to know that I have suffered with many bouts of diarrhea, acute and chronic and I know how horrible it can be. The other thing that can cause distress is the embarrassment factor. Having a bowel movement is the most natural thing in the world but most people want to do this in private and sometimes when diarrhea strikes, privacy flies out of the window. Accidents happen, noises happen, and then we feel bad. Remember this has probably happened to everyone at some time. I do understand however that sometimes we would rather be anywhere else! 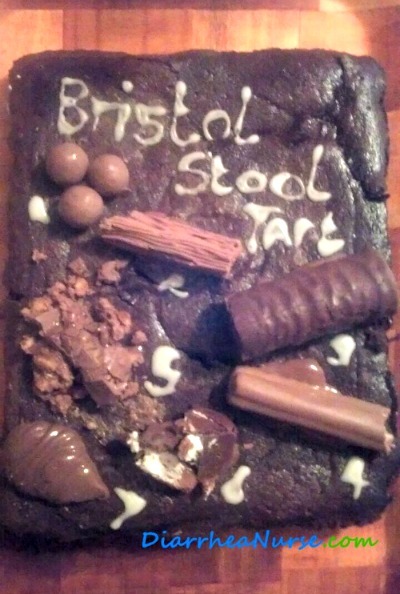 Recently my daughter who works as an Occupational Therapist in a London hospital made this Bristol Stool Tart for a work function. I include the picture of her cake here to illustrate that although we may be embarrassed by our diarrhea, for many professional people it is something which they take in their stride! The nurses loved it by the way. Diarrheanurse.com hopes your diarrhea symptoms clear up quickly which in most cases they will but if you have other accompanying symptoms or your diarrhea is not improving then please seek medical advice. Please browse the Diarrheanurse site for information about the causes of diarrhea. Dehydration is one of the symptoms of diarrhea which can be dangerous if left to go to far. Know what to watch out for and what to do if dehydration strikes. How long does stomach flu last and how do you know that you have it? Find out here.